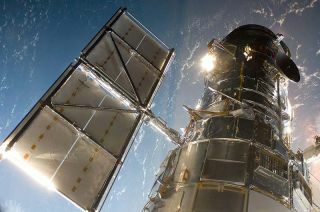 This NASA photo shows the Hubble Space Telescope in May 2009 as Atlantis astronauts release it into space after its fifth and final overhaul. Hubble launched into space on April 24, 1990 and celebrated its 20th birthday in 2010. AUSTIN, Texas — In an age of dwindling budgets and political pressure for research to provide tangible benefits to society, a prominent astronomer says science should aspire to more than that. "The fact is I think that people really do want to know where we came from, where we're going, where we are," said Robert Kirshner of the Harvard-Smithsonian Center for Astrophysics in Cambridge, Mass., during an address today (Jan. 11) here at the 219th meeting of the American Astronomical Society. Kirshner contributed to the discovery in the 1990s that the universe's expansion is accelerating, which scientists now think is caused by a mysterious entity called dark energy. Two of Kirshner's former graduate students, Adam Riess and Brian Schmidt, were awarded the Nobel Prize in 2011 for leading this work. "I think this is a kind of science that probably shouldn’t be justified narrowly" in terms of how it helps the economy, improves defense or extends life, Kirshner said. "Even though I think it is true that science does all these things and is a path to making us rich and safe… that is not the reason that we're doing this and it's not the whole story. If we were all those things and bored that would not be a vision of perfection." Follow SPACE.com for the latest in space science and exploration news on Twitter @Spacedotcom and on Facebook. Twitter users can follow news of the AAS meeting with the hashtag #AAS219.